After a weekend of working in the gardens and painting outdoor furniture I got a new perspective of a painting that I was struggling with last week and finished it this morning. Golden Hillside, an oil pastel (11×14) was painted on a gesso prepared hardboard using mainly Holbeins, Neopastels and Sennelier oil pastels – most blending was done with my fingers and foam insulation. An acrylic underpainting was done first, I think the values of the colors choosen fro the UP were too high and my gut tells me that was probably what gave me so much angst in working in the sunset colors with the OPs. My goal with this piece was to capture golden colors hitting the hillside just as the sun was setting. A reference image from Leona Fraser of pmp was used for inspiration. This entry was posted in About Oil Pastels, OPs New Paintings and tagged Hill, oil pasel, painting, sunset, tree. Bookmark the permalink. Thank you Violet for your wonderful comments – so glad you enjoyed this piece. The light on the hill is so warm. Lovely, Mary! Thank you so much Francesca – the feel of warmth is exactly what I was hoping to achieve. Have a great weekend. What a beautiful comment Jo, thanks so much! Happy walking and weekend surprises. Interesting that you find your inspiration doing something else. It’s a good reminder that occasional breaks are okay to feed our creativity. Thanks Evelyne, the breaks do me wonders, a refreshed eye. Have a nice weekend. 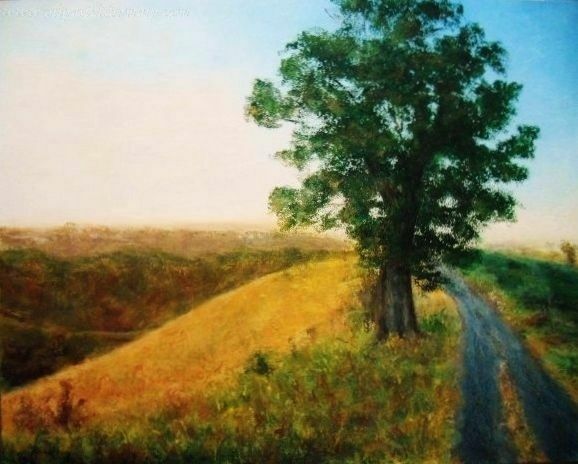 Glad you found the way to finish this painting Mary .. love your hillside glow .. all I need now is a picnic and I’ll happily lean up against your tree and contemplate the sunset …. Thanks Poppy – could you imagine this being in your backyard? What a view – picnic sounds good as nature gives it her all. Isn’t it true that balancing values in a piece is as difficult as balancing them in life;) But, you figured it out. I like very much the acrylic underpainting. Lovely. What a great statement Elena, spot-on about values. Thank you so much! If it was a golden hillside you were going for, you surely accomplished that. What I really like about it, though is that it looks straight from a dream! I don’t know why but if I see any color in my dreams they are full of golds and yellows with a touch of blue. I’m walking that road! Thank you Leslie for your feedback – this was an interesting atmosphere to develop. Love the golden glow. Haven’t seen proper sunshine or sunsets for days. This is a good reminder of what will come again. The sun is coming Gallivanta – thanks very much for your feedback! You’ve captured one of my favourite scenes beautifully in this painting, Mary. The shade of gold is just right, as is the blending of the sky. Gesso on hardboard (or, my personal preference, on masonite), is a godsend. Great job! Thank you Millie, glad you enjoyed the piece. 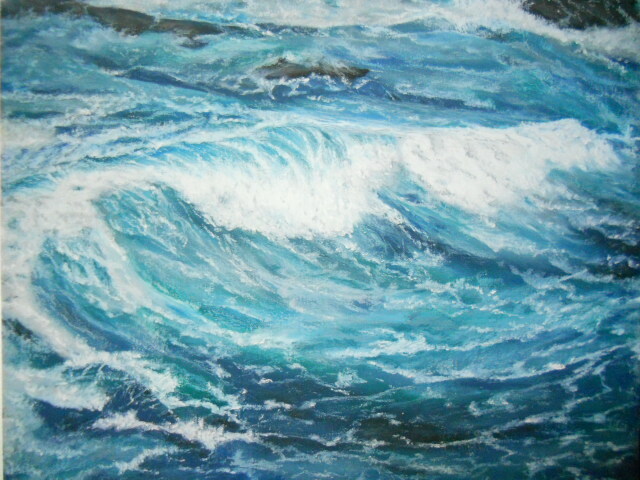 I do love to paint on hardboard, it’s a beautiful surface for oil pastels. My only complaint with it, the gesso doesn’t do well with razor scraping that I do often in my paintings. I know what you mean, Mary! I tried scraping a few times but found that I could only achieve the results I wanted on canvas. How long does it take for oil pastels to dry out? Hi Millie, that’s a great question. Oil pastels never dry, they’ll slightly harden, but you could touch the painting 20 years later and it will still smear. Some artists have tried fixatives, etc. but that has led to the painting colors to yellow. So OP paintings has to be under glass. That makes sense, Mary. I read an article once about a Rembrandt oil painting that took 500 years to gain the consistency of a tabletop. A glass cover would be the prudent way to go. 500 years is an incredible amount of time – interesting tidbit. Thanks Dorann – it’s a pretty little spot on someone’s property in Australia. Can you imagine seeing these sunsets almost daily! Beautiful golden tones Mary, it really warms up the whole canvass and lands a glow to it! Thanks Eva so much – glad you enjoyed the warm tones. Have a beautiful week. Beautiful scene Mary. Love the essence of golden light! Thanks Rhonda – means a lot. Thanks Marina – have a wonderful week! Gorgeous, Mary. You absolutely captured a beautiful gold on the hill. Quite a compliment, thank you – means a lot! this is lovely Mary, well done!